Just weeks before you're second birthday, we rocked your world by giving you a little brother. I braced myself for epic tantrums, meltdowns the size of Texas and regressions like I'd never seen before. You shocked the heck out of us, kid and eased into your new role as Big Brother both impeccably and seamlessly. We couldn't be more proud of you. You occasionally try to cover his head with a blanket but we know you're only trying to be nice. You're wearing 4T tops and 3T bottoms with a size 9.5/10 shoe. Thankfully we can still squeeze your tush into size 7 diapers. You love to pick out your jammies each night after your bath and nine times out of ten you reach for your "choo-choo" jams. Speaking of jammies, bedtime is still a bit of a chore. You're sleeping great- 9pm-8am nearly every night but sometimes it takes an hour to put you to sleep. There's just too much going on in your little world and it appears a bit difficult for your to turn it all off at the end of the day. Sounds just like your Mama. We celebrated your 2nd birthday with a Curious George party here at the house. You loved it and you loved having all of your little friends over in your playroom. You also really loved the cupcakes. And the banana pudding. And the cupcakes. Again, just like your Mama. Your Aunt Pam and I took you for your first haircut on a whim. I dialed up Aunt Pam and asked her to meet me at the mall where we whisked you into a Master Cuts salon with a JLo-esque hairdresser who spoke broken English. It wasn't exactly how I envisioned your first haircut but despite my reservations, nerves and clenched fists, she did a wonderful job taming those beautiful golden curls. Did I mention you screamed and cried? You absolutely love taking walks in the neighborhood and will gladly lead the way with Daddy, Maclane, Sheepie and me in your wake. You'll know your way to the local park and tackle the giant jungle gym with ease, giving Mama a heart attack every time you go down the twisty slide all by yourself. You spent some time in Mr. Steve and Ms. Lisa's pool this summer and we were so thankful for such wonderful neighbors (and fiancees) who welcomed you with open arms and taught you how to "kick kick kick" and "blow bubbles" while wearing your floatie. You just wanted to do your own thing. You love giving hugs, especially to other kids your age. So much that you'll chase them at the local park just to wrap your arms around them. Who knew you'd be such a little lover? Your favorite toys are your Melissa and Doug train table, a gift from Gammie, Poppy and Woobie and your remote control car from Daddy's company. You could sit and play with each of these for the longest time. 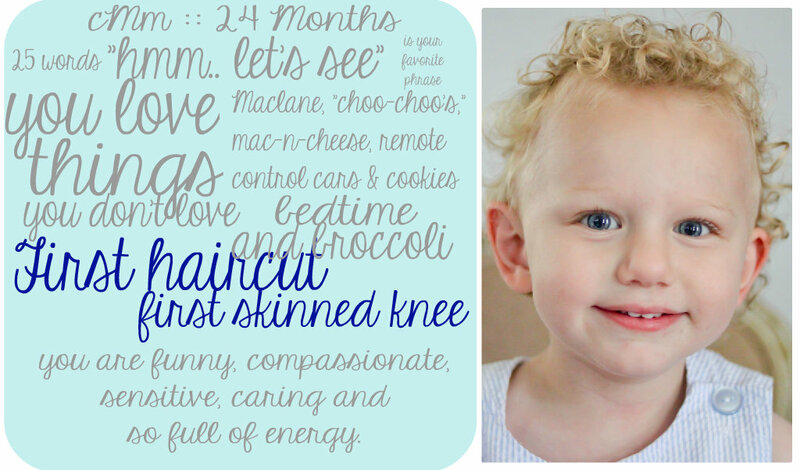 You've got a big heart, Carterito and it's quite evident at just 24 months old. You're turning into such a unique, compassionate, spunky little boy. You love to laugh and play and we can't get enough of you! Happy 24 months, Carterito. We love you more than carrots! What a sweet update on your 2yo Carter. Rhys also loves hugging other kids, and luckily they've not run away from too much affection! Carter is such a sweet boy and a great big brother - I'm sure it makes your heart feel so full! Great job, mama - you raise 'em well! aw happy birthday little guy! love the update and what a good older brother he is! You'll have to share how you got him to do that...I'm totally curious. He didn't skin his knee until 2?! My kid has had skinned knees since he could walk I think. Where do you find size 7 diapers? Noah is still in 18-24 month clothes but he pees through his size 6 nighttime diapers. With no 7s found I switched him to pull ups at night (still size 6 during the day).